Local journalism is in decline, so I've picked up the baton. Here's the very latest news from our local street. Barclays have announced that their bank at 92 Bow Road is to close. Doors will shut at 4.30pm on Friday 7th June, after which customers will have to bank online or elsewhere. The Nat West across the road also closed in 2017, hence in three months time there'll be no banks anywhere along Bow Road. 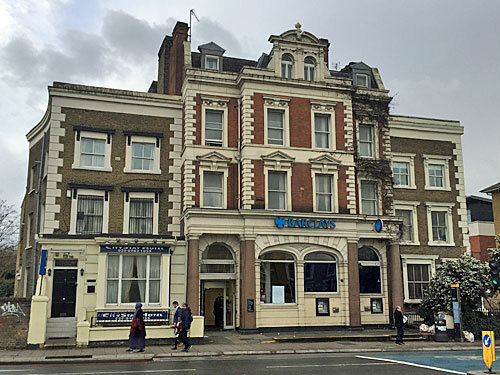 A Barclays spokesperson admitted that the number of transactions at the Bow Road branch had increased over the previous 24 months, with the number of cash deposits rising by 15%. "However 87% of our branch customers also use other ways to do their banking such as online and by telephone," she said. "Also we've calculated that 51% of this branch's customers also use neighbouring branches, so we're pressing ahead and closing it anyway." Over 4500 regular customers will be inconvenienced. "I've been coming here for years, even though it's a bit grim inside," said one customer who refused to give their name. "Now I'll have to travel to the Barclays 0.7 miles away on Roman Road, or the Barclays 1.3 miles away in Poplar, or the Barclays 1.6 miles away in Stratford, at least until they close those down too. I know people in other parts of the country would kill to have an alternative bank within one mile, but it's a sad day for Bow Road and no mistake." Barclays Bank is located immediately alongside the City Stay Hotel, whose most famous Russian guests checked out exactly one year ago. There has been speculation that the hotel's owners might want to buy up the empty bank premises and knock through, but this has yet to be confirmed. Worshippers at Bow Central Mosque now have the added opportunity of shopping before or after their daily worship. 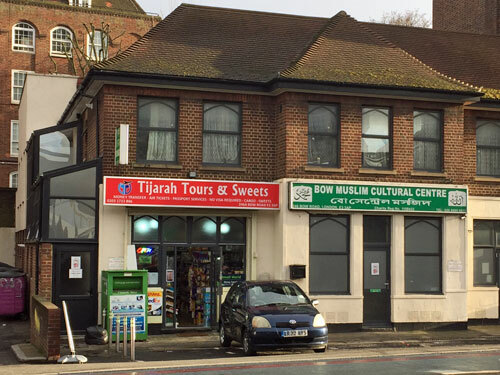 That's because Tijarah Tours and Sweets has opened in what used to be one of the downstairs rooms, offering money transfer, air tickets, passport services and sweets. In an age of online travel, local residents can now drop in after prayers for friendly advice on travelling abroad whilst buying Haribo-style confectionery. The number of destinations is somewhat limited, with pilgrimages a speciality, but the variety of sweets available in store is particularly extensive. The owners have also set their sights on becoming Bow Road's go-to repository for Fed Ex packages, delivered with a smile and a friendly sugar high. Why not visit before Jumu'ah and see for yourself? Residents on the Bow Bridge Estate have found themselves overlooking a demolition site as what used to be Jolles House is reduced to rubble. Poplar Harca plan to build 70 residential units, 96% of which will be affordable, on the site of a block of flats, a basketball court and a Victorian pub. Demolition of the pub, which has been derelict for several years, has not yet begun. The Blue Anchor pub was built in the 19th century and is one of the last surviving heritage assets on Bromley High Street. A council planning officer said "The Blue Anchor has been renovated and altered over time and has limited historic fabric remaining. The demolition of the pub is considered acceptable given the benefits of the proposed scheme and the quality of the replacement buildings." 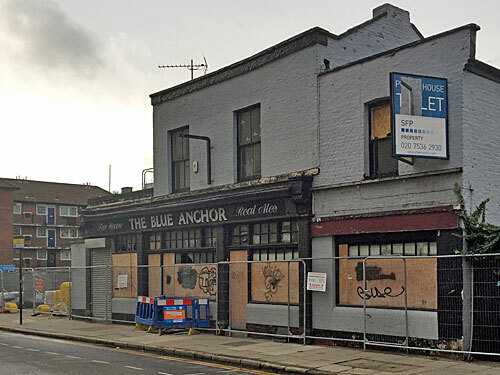 Former regular Percy Baxter, 82, said "I've had many a happy night in the Blue Anchor, but now it's being turned into flats which'll look like every other new development in London. Admittedly I've been living in Romford for the last thirty years, so heaven knows who was still drinking there at last orders, but it'll be criminal to see that empty boozer destroyed." 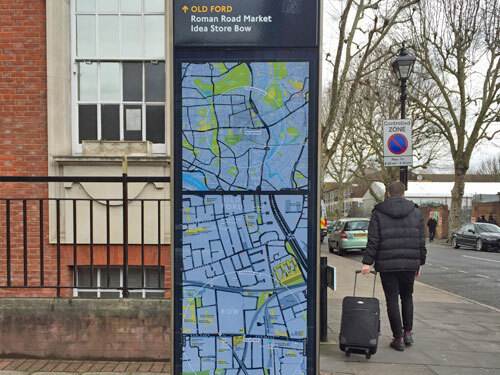 After months of local despair, the enamel map outside Bow Police Station has been repaired. Local youths sadly smashed the top and bottom panels months ago, leaving two useless holes through the middle of the pillar. But now the council or TfL or whoever's job it is to repair these things has finally come along with replacements, and visitors can once again negotiate their way around the surrounding streets. Local campaigner May Dupname, 62, said "This sign has been an eyesore ever since it was destroyed by mindless thugs. I had given up all hope of it ever being repaired, what with austerity and everything, because these things can't be cheap. But it just goes to show that mindless pessimism is sometimes wrong. I just hope the new panels are properly vandalproof." • The entire car lot at Enterprise Car Rentals has been demolished. In the 1960s this stretch of Bow Road was the site of the Kray Brothers famous Double R Club. The business continues to trade around the corner in Paton Close and will return once works are complete. 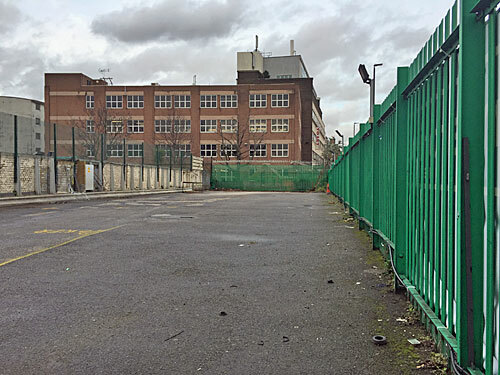 A new portakabin is to be built, reorienting the site with a new pedestrian entrance on Bow Road. • The Bow Pizza and Grill, whose underwhelming carb options were squeezed into an arch under the railway line, has closed down. However feet and cleaning materials have been spotted under the shutters, so expect some kind of deep-fried rebirth. • Meanwhile at 163 Bow Road, internal reorganisation at the former Kebabish continues unabated. Workmen have been busy inside shifting counters, tweaking plumbing and slotting in new electrics, in readiness for a marginally-fresh venture which it's just been revealed will be called the Myra Grill. 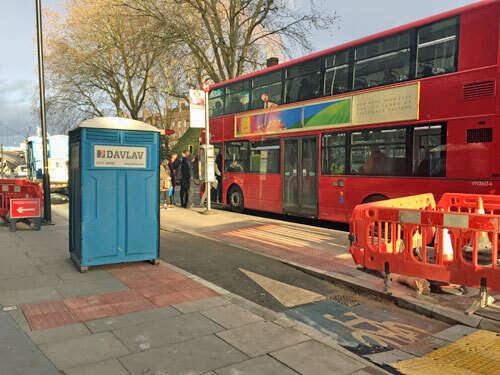 Disruption at Bus Stop M opposite Bow Church may be coming to an end, as a contractor has turned up to take the Davlav portaloo away. Removing the blue plastic cubicle proved somewhat problematic as it was briefly abandoned in the middle of the new mini zebra crossing, then dragged slowly down the cycle superhighway towards the back of a truck. No more than one cyclist was inconvenienced by the convenience. Although it might appear that workmen have been doing bugger all for the last week, tweaking a teensy bit of kerb and eating sandwiches, the temporary yellow covers at the entrance to the bypass conceal considerable digging and a deep square shaft. Possession of the site lasts for one more day, after which piles of signs, slabs and equipment will need to be carted away. 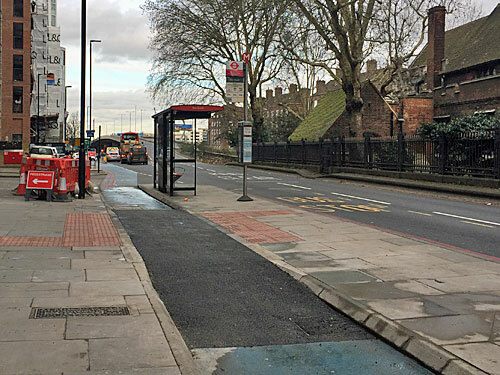 Alas it appears that only half of the bus stop bypass will have been converted by this time, and that the rear island will be left with its original kerbstones and less prominent tactile paving, possibly forever. Noon update: Unexpectedly on Day Six a bunch of additional workmen have arrived and are attacking the central hump with drills. Now reduced to irregular chunks, all the tarmac is being lobbed into the back of a truck and piled up ready for disposal. Today's workers have no portaloo facility. 2pm update: A new tarmac hump is being laid, longer than before, to create broader public access between pavement and bus stop. Much mini-steamrollering is occurring. The extended ramp has entirely covered a former drain in the cycle superhighway, which explains the extra guttering and additional sinkhole one metre distant which the workforce spent so many hours constructing. 4pm update: The workmen have packed away most of their equipment and left. Cyclists are already whizzing over the freshly-laid tarmac hump. It has not yet been painted, so has no markings and does not resemble a mini zebra crossing. No work has taken place on the ramp leading to the other half of the island. Bus Stop M is open again, and should stay that way.